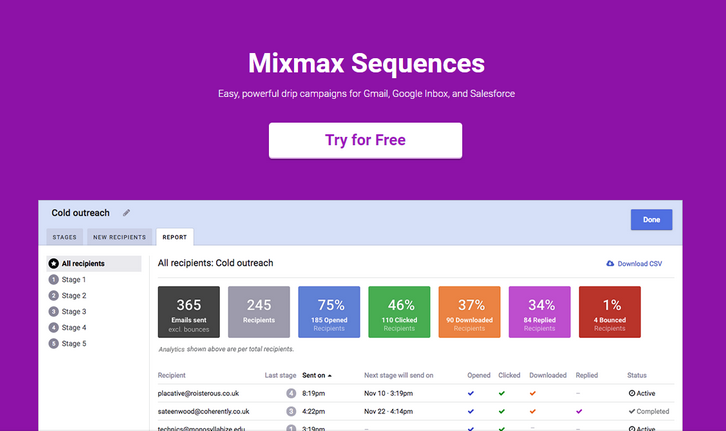 Mixmax Sequences is easy, powerful drip campaigns for Gmail, Google Inbox, and Salesforce. You can easily add contacts, prospects or recruits to your outbound campaigns. Customize messages with variables to keep a human touch. If you’re in Salesforce – add any contact or lead to a Sequence directly. You can also save time by setting up follow-ups that automatically send based on triggers. Best of all, you can get instant stats for all your sequences, even by stage. Opens, clicks, downloads, replies, bounces — you’ll know exactly how you and your team are performing to start perfecting your messaging.